These NFC wristbands are available in adult and child size with different colour options like red, blue, green, yellow, white, black etc... They are embedded with 13.56mhz NFC type2 ntag203 chip inside which can be read by any NFC reader or any NFC capable mobile phones or tablets. These are ideal for event management, ticketing, loyalty, brand promotion, charity or access controls. 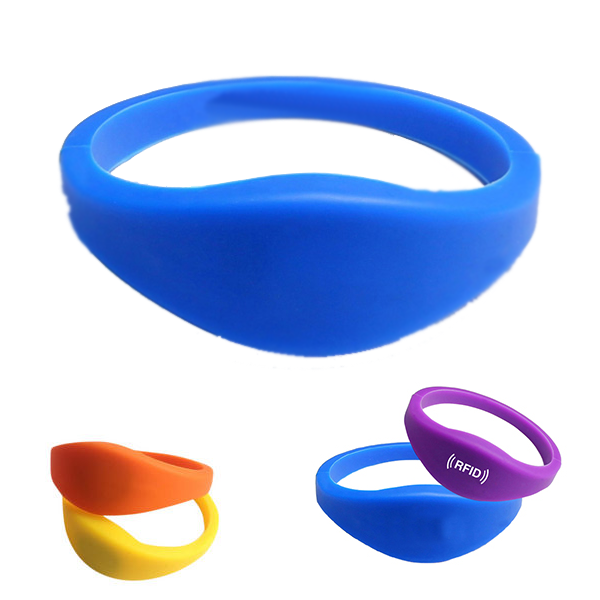 These silicone wristbands are 65mm in diameter to fit most adults and the strap stretches easily and they fit great. This is a very well made, durable and comfortable wristband. Waterproof, dustproof and weatherproof. NFC Type 2 Tag is based on ISO/IEC 14443A. Tags are read and re-write capable; users can configure the tag to become read-only. Memory availability is 48 bytes and expandable to 2 kbyte.